Thackerville, Oklahoma - In a month filled with upsets in the sport, another one is added yet again tonight in the record books. Top Rank’s hot prospect and unbeaten featherweight Roberto Marroquin (19-0, 14 KO’s before the fight) of Dallas, Texas suffered the first loss of his young career against Francisco Leal (14-5, 9 KO’s) of Mexicali, Mexico. Marroquin, 21, who is ranked number 12 by the WBO and number 14 by the IBF at featherweight came up strong early in the fight but Leal held up on his own and counterpunched his way to a victory with a split decision win. The match was a bloody war due to a cut that Marroquin suffered in the 9th round after another accidental clash of heads in the 10 round fight. Marroquin’s left eye also bore the heat of Leal’s punches as it was almost closed to shut when the fight ended. The win ended not only Marroquin’s 19 fight winning streak but also Leal’s two loss streak in a fight where Leal is to be yet another record win for the unbeaten prospect from Dallas. It did not help that his last fight was eight months ago on a 12 round draw against Miguel Gonzales Piedras (11-2-0) in Mexico. Leal arrived here at the WinStar Casino in Thackerville, Oklahoma just 75 minutes away from Marroquin’s hometown of Dallas, Texas on a mission. He was not deterred by the pro- Marroquin crowd who trooped here to support their hometown fighter. 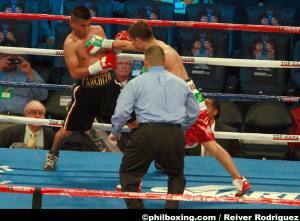 He out punched and out boxed Marroquin who was kept on the defensive for the most part of the night. He left with the biggest win in his career so far in an entertaining fight that was broadcasted by Fox Sports Network (FSN) and Top Rank Boxing as their main event of their Top Rank Live Boxing series. The judges scored it 98-92 and 96-94 for Leal and one judge had it 97-93 for Marroquin. The loss dropped Marroquin’s record to 19-1 in what has been a busy year for him. This was already his third fight of the year, two of which he won by knockouts. Indeed this month is turning out to be an unfriendly one for the favorites and unbeaten fighters of the sport. It is definitely good to be an underdog in boxing in this month of April. Roberto Marroquin (L) is shown in this file photo fighting against Francisco Dominguez in Dallas, Texas last November.